Headed to NOLA? Don’t miss these spots! Annual cocktail event Tales of the Cocktail is kicking off its 11th year this week, and just like during Mardi Gras and the New Orleans Jazz and Heritage Festival, it’s a time when the city is overrun by out-of-towners. In this case, it’ll be bartenders, pro drinkers, and cocktail enthusiasts; nothing the city hasn’t seen before. But as far as native New Orleanian and current Angeleno Kat Witt is concerned, if you don’t explore outside the touristy confines of the French Quarter then you haven’t experienced the real New Orleans. Kat, the former director of operations for the recently closed Tom Bergin’s Tavern, will be alighting upon the Big Easy along with your favorite L.A. bartenders this week for the annual cocktail convention. Disheartened by the fact that these annual visitors never really explore outside the Tales borders, she took it upon herself to create an informal tour of the city for her friends showcasing places and must-dos. 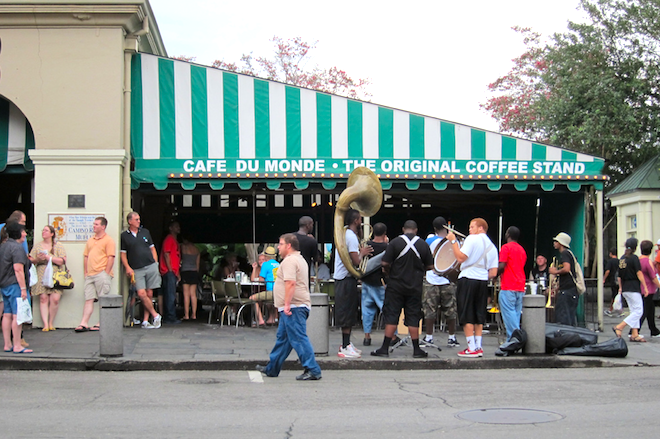 She shared her N’Awlins itinerary so you can do it yourself. Don’t forget to bring your Go Cup! ➼ Have a drink at Ms. Mae’s on Magazine at Napoleon, one of the diviest of dive bars. The city had a fit a couple of years back when the well drink price went up to $2. ➼ Spend a few minutes there to soak up the local color and then walk Magazine Street in either direction, Go Cup in hand. My number-one rule when wandering: If I hear music, I’m stepping inside to check things out. ➼ Walking Magazine, you’ll cross at least three more dives if your Go Cup needs a refill. You’ll also pass SnoWizard and their classic snowballs. You can add a shot from one of the dives if you require a booze cold treat. ➼ Lafayette Cemetery, located at Washington at Prytania. Yep, it’s hot and humid. Embrace it! The history told in the names and dates on these graves is fascinating and it is a surprisingly peaceful place. ➼ After lunch, a two-block walk gets you back to St. Charles and the street car line headed downtown … back to Tales.